David Haye claimed the WBA and WBC cruiserweight titles after a superb seventh-round knockout victory over Frenchman Jean-Marc Mormeck. The 27-year-old from London unleashed a frightening combination made up of a right upper cut, left, then right hook to floor Mormeck. The technical knockout was all the more remarkable after Haye was put on the canvas in the fourth round. The win means Haye becomes Britain's sixth world champion. He joins Joe Calzaghe, Enzo Maccarinelli, Clinton Woods, Junior Witter and Gavin Rees while unbeaten Ricky Hatton is set to face Floyd Mayweather in December for the undisputed welterweight title. 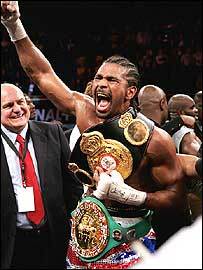 But Haye, nicknamed the Hayemaker, believes he is now part of an even smaller select group. "To be honest I am one of three undisputed world champions - Calzaghe, Hatton and now me," he said. "Just because you have one title doesn't mean you are a world champion." Haye said he was confident of getting himself back into the contest despite the hiccup in the fourth. "I workled my way back into the fight and showed great heart," he added. "If I'm landed flush, I'm landed flush, but it's 12 rounds. I came through and once I landed that upper cut I knew he was hurt. I could have kept going all night long." Early in the contest it did not look as if Haye could go "all night long" as he failed to make the most of his extra six inches of reach. After a good opening round, Haye was put on the back foot by the Frenchman, taking a right hand to the chin in the second. The Londoner, who struggled to make the fight weight and is likely to return to heavyweight, managed to sneak through Mormeck's defence with a left hook and left into the body but then let his own guard down in a dramatic fourth. Haye appeared to half slip and half fall after he came in contact with a left then right over the top from Mormeck, which stirred the crowd at the Palais des Sports Marcel Cerdan, near Paris. But Mormeck, who is renowned for grinding out his wins, did not take advantage of the situation and allowed Haye space to recover in the next two rounds. Not many in the 4,000-capacity arena would have predicted what was to follow in the seventh. Haye moved his opponent to the ropes before his quick hands pierced through Mormeck's guard and in a blink of an eye the 35-year-old was down. The Frenchman rose but the referee declared the fight over on a technical knockout. "This guy was very tough but I showed patience and class," the Briton said of Mormeck. "The legs are not there at cruiserweight but they will be there at heavyweight." Haye challenged WBO champion Enzo Maccarinelli to a contest but said he would only meet him at heavyweight. "I would go anywhere (to fight Enzo). I would love to make that fight. It would be great for the fans so let's get it on," he added. Maccarinelli replied: "You have to admire David, he is a good fighter and we are very respectful of each other. "But I don't think for a minute it is going to happen at heavyweight. I would be stupid to jump in at 15 stone because it is not my weight limit. "I will definitely fight him whenever, at any time, but I can't give away two stone of natural weight." Haye's manager Frank Maloney added: "We will sit and talk about it and make a decision but he just has to enjoy this tonight. Seventeen weeks of hard work have paid off."